I left San Francisco early in the morning on 19 August, headed north. 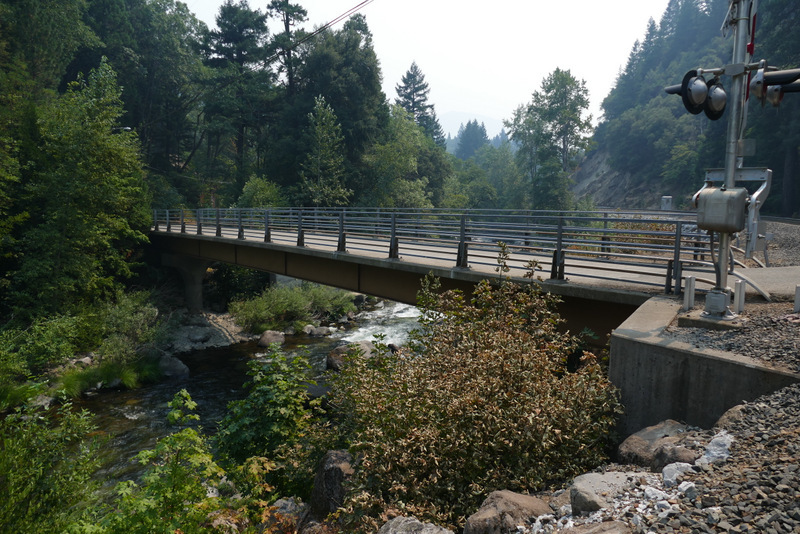 My first stop other than gas and lunch was at I-5 exit 707, where i took little dirt Fenders Ferry Road through the woods to the bridge that i just barely photographed last winter since it was late afternoon then and almost dark down at the bottom of the canyon. That road is nearly impassible in the wintertime, being so rutted and washed out, but it’s well graded in the summertime. 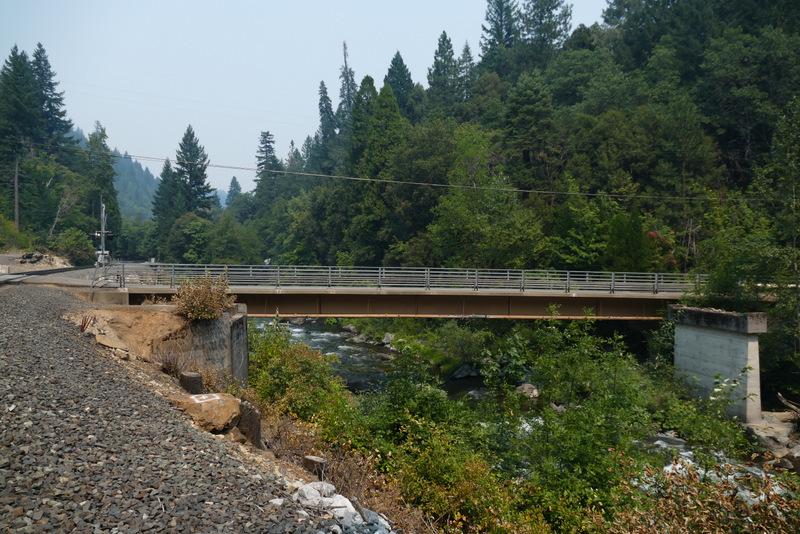 Here it is under the beautiful old I-5 bridge over Dog Creek shortly before it is subsumed by the Sacramento just south of my destination. 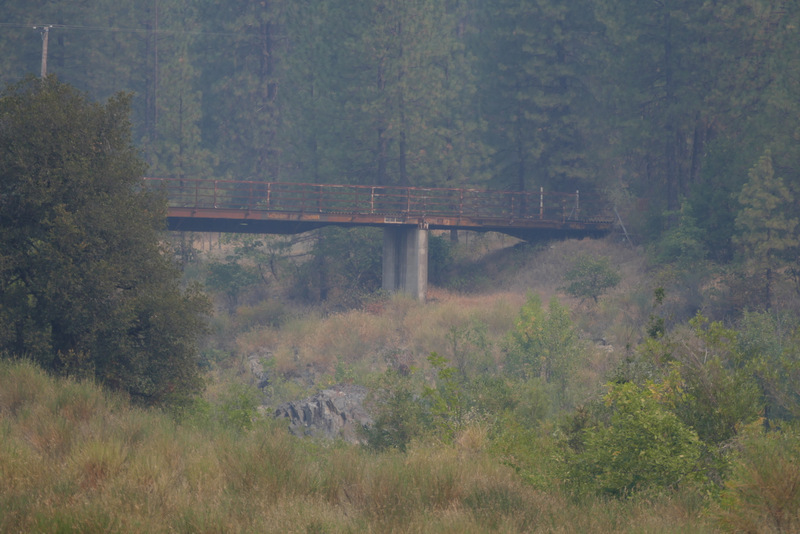 The Fender Ferry Bridge over the Sacramento is just a quarter mile beyond that highway bridge. Here it is with a little sun on it, wildfires having put a pall of smoke over this entire area. 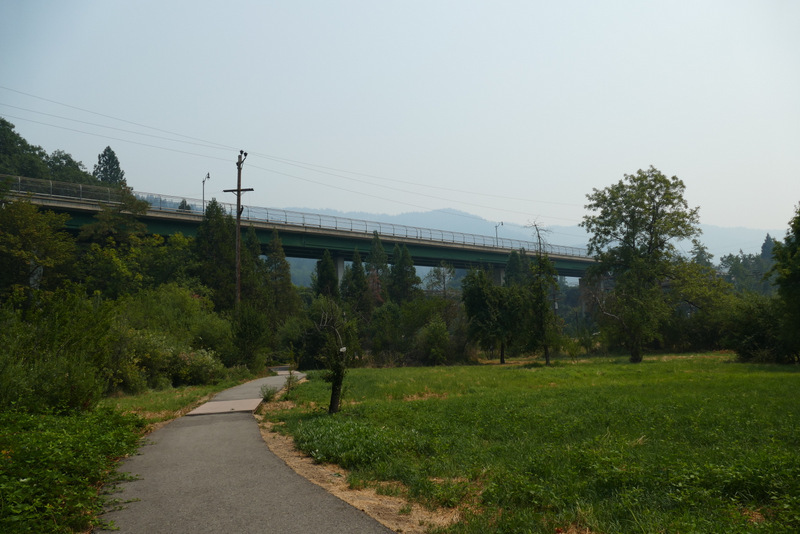 Back onto I-5 and up to Pollard Flat, exit 712, in high hopes of getting a photo of the North Salt Creek Road bridge over the Sacramento. 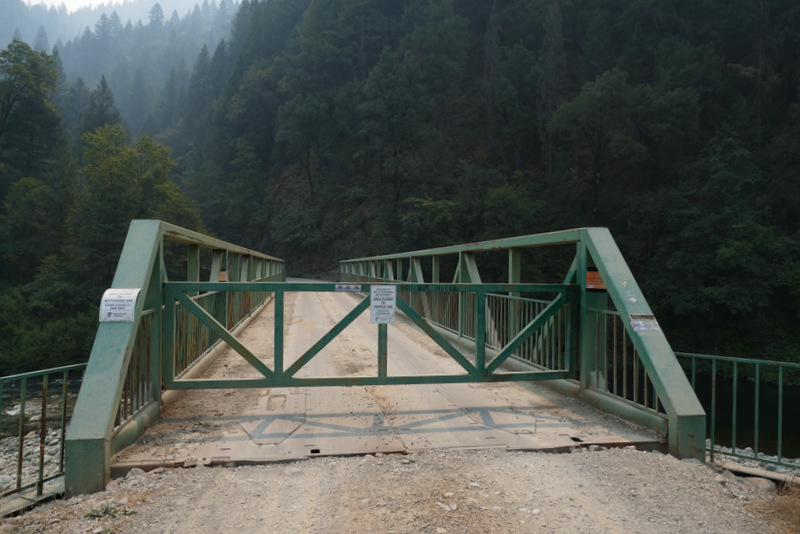 I had not been able to get close to it last winter because the unidentified road that i took to be Salt Creek Road was gated shut. 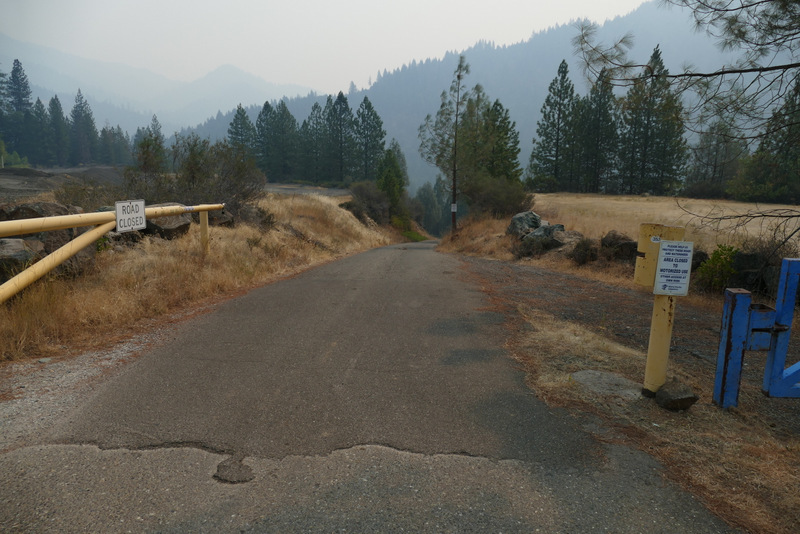 While there’s still no sign saying “Salt Creek Road”, at least the gate was open. 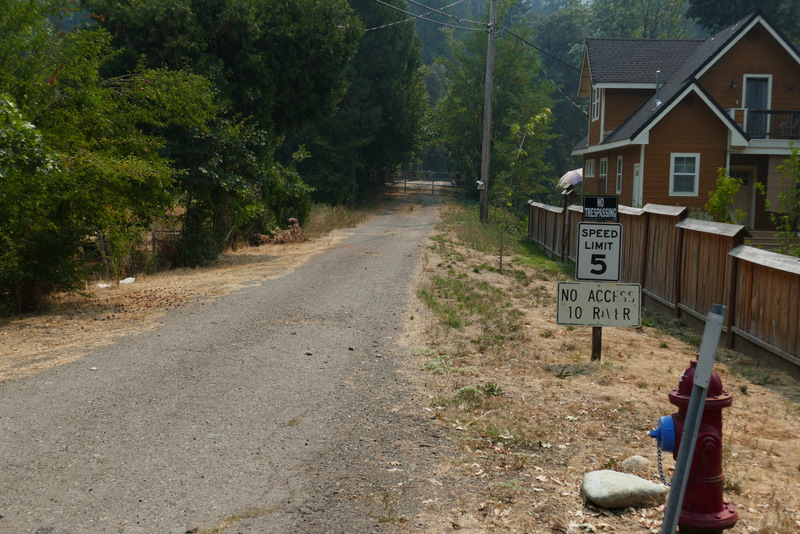 Zoom in on that sign to the right and you’ll see that it reads “Area Closed to Motorized Vehicles. Others Access at Own Risk.” How utterly enticing. So i parked the Prius there and rode the Segway down the road. 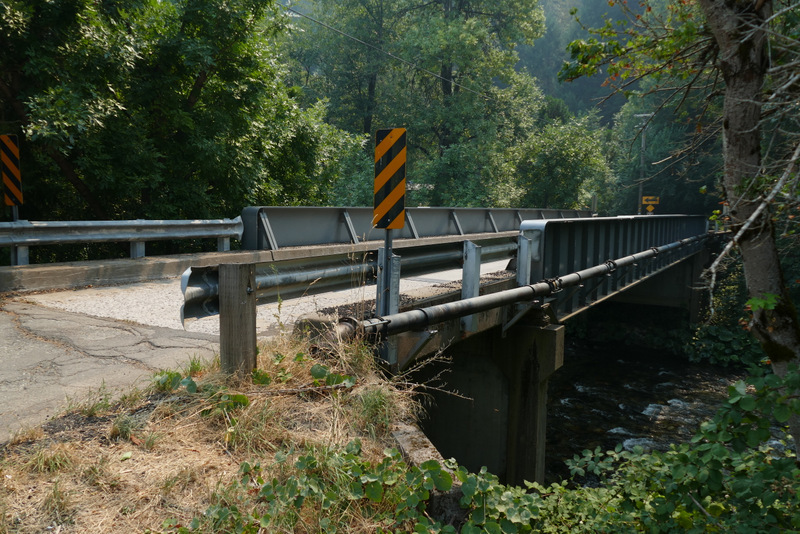 The paving ended just after the first bend, but the road was well maintained, and after about a mile through the woods i came to the bridge. A feature of the other side of that gate was a stout padlock, so all i could do was get a side shot of the bridge. 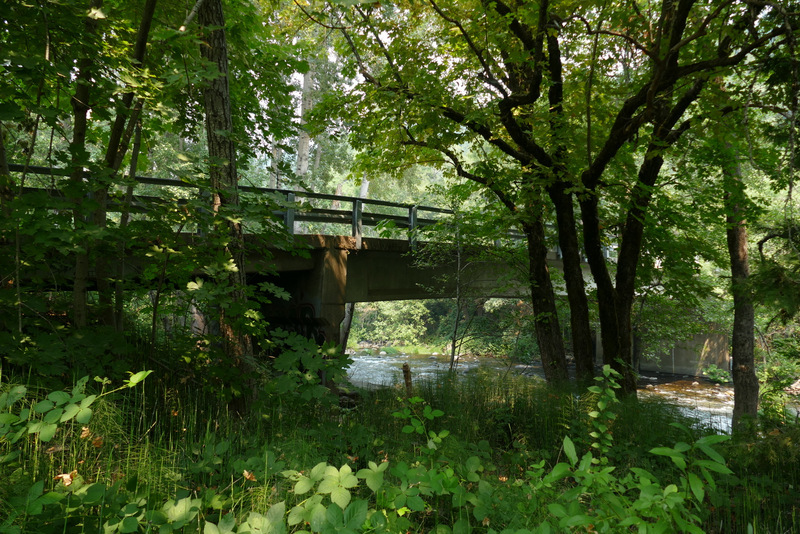 Emboldened by my success in finding this bridge, i ventured off onto a side road in hopes of finding a second bridge nearby, and yep, after only a quarter mile on the side road i spotted this. Got closer and found it also gated and padlocked. But at least i could get a shot from the side. 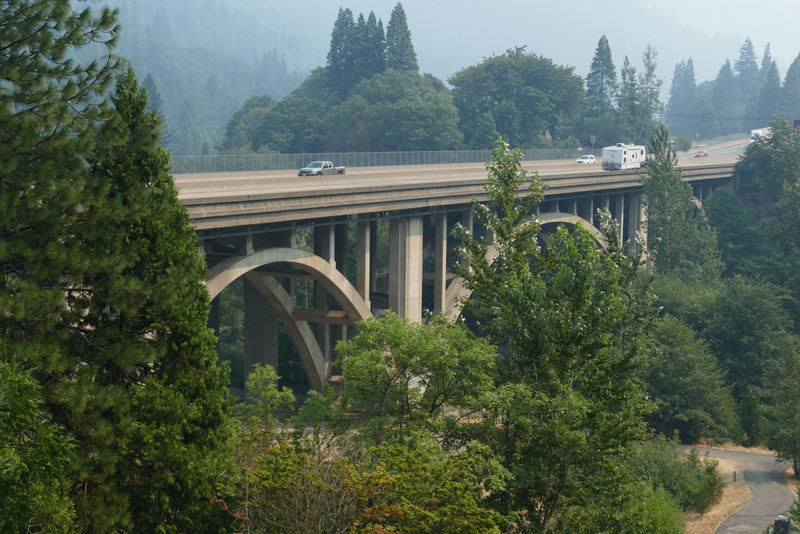 Basking in an adrenaline rush over having bagged both of those bridges about which i could find absolutely nothing on the Internet, i got back up onto I-5 to Sweetbriar, exit 723, where i got this shot of the Falls Avenue Bridge. That purple rose is not growing wild. The guy in the house next door has extended his garden up to the bridge. Here’s the other side. 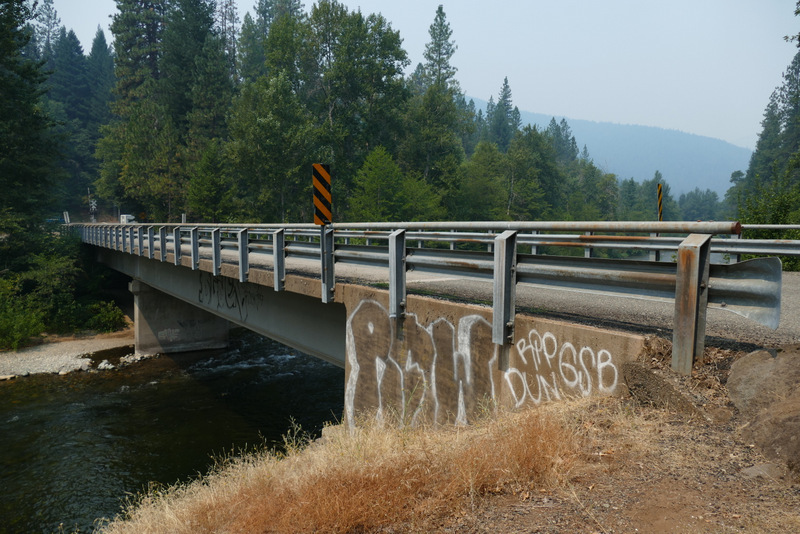 Then up to exit 726 for the Soda Creek Road Bridge. 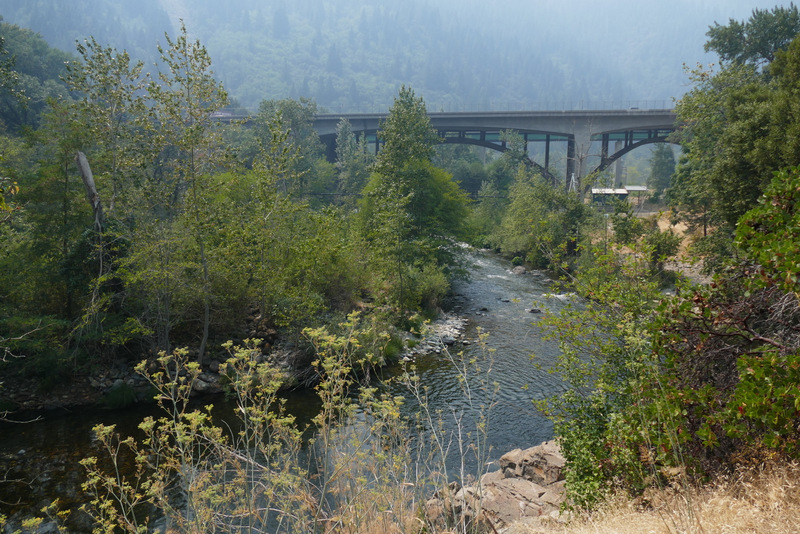 Note: There are many exits on I-5 at which there is no commercial development, the exit serving only to provide access to the many half-to-well-hidden houses that dot the riverbanks and hillsides. 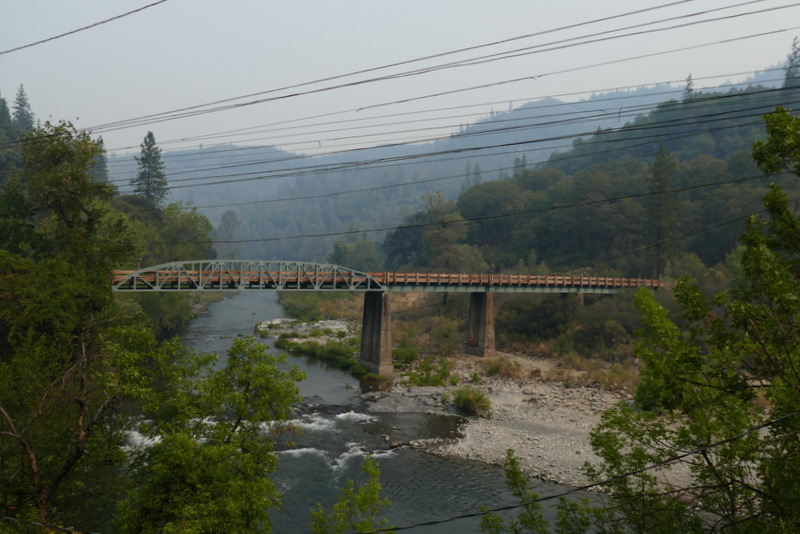 And then up to Dunsmuir, where the first seven bridges over the Sacramento are found. 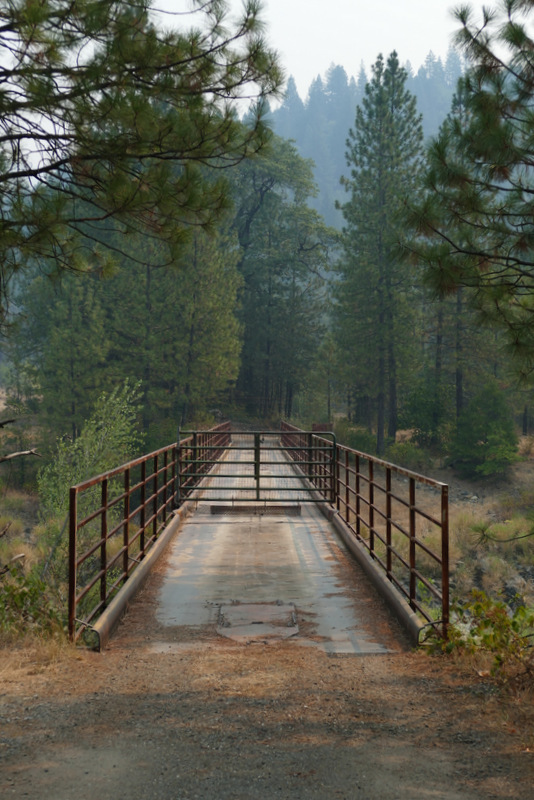 The source of the Sacramento is the point a couple of miles west of Lake Siskiyou where the north and south forks of the Sacramento join, but there are no bridges over the Sacramento before it reaches Dunsmuir, the road over the top of the Lake Siskiyou dam not counting as a bridge. 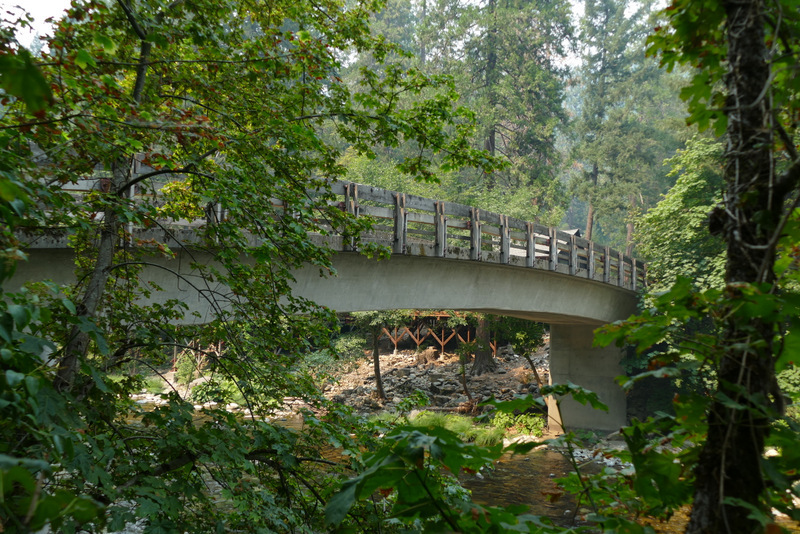 The First Street Bridge, the southernmost bridge in Dunsmuir, was rather a disappointment, as i couldn’t even get a glimpse of it. 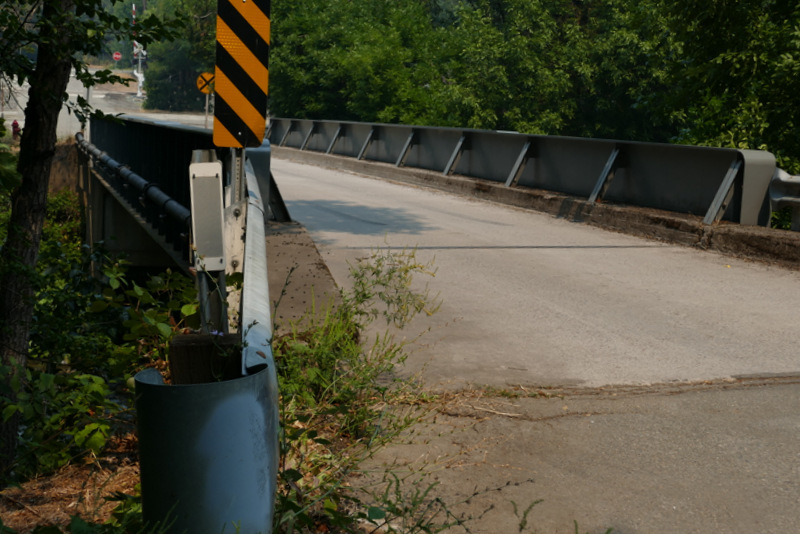 Stifling my disappointment, i drove north to the Bridge Street Bridge, where i was more successful. Not that a good view was available from either side. I had much better luck with the Bush Street Bridge. And even better luck with the Sacramento Avenue Bridge. The next bridge north is the I-5 bridge. 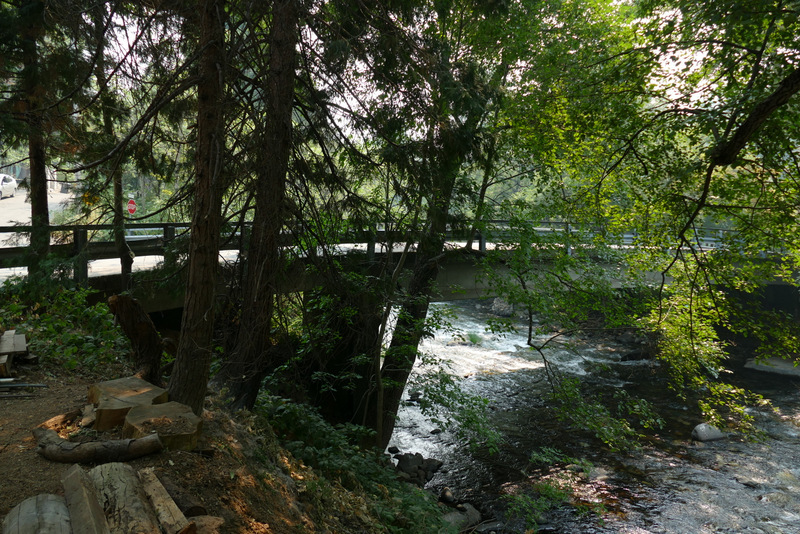 And about fifty yards upstream of that, the Dunsmuir Avenue Bridge. Here it is in front of the I-5 Bridge. 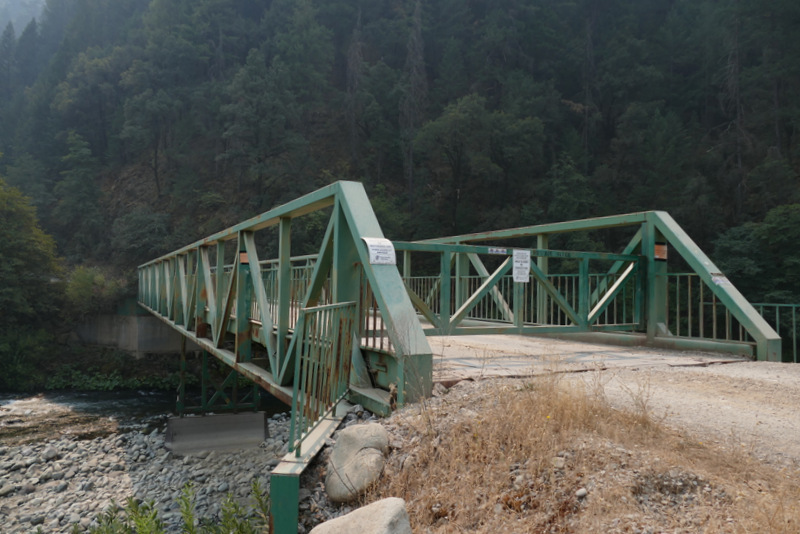 And finally, the first bridge over the Sacramento River, the Cave Avenue bridge, another one hard to photograph. Can’t see it any better from the other side. And that’s it for the Sacramento River. 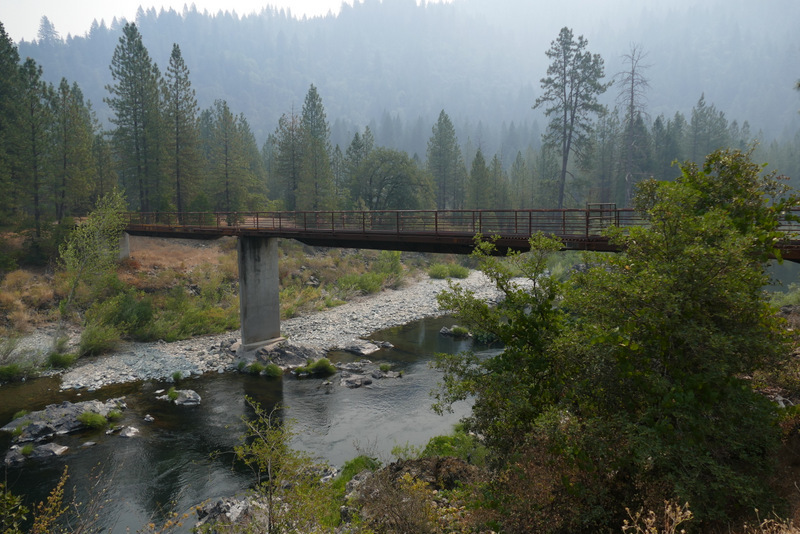 I now have photos of almost all of the bridges over it. 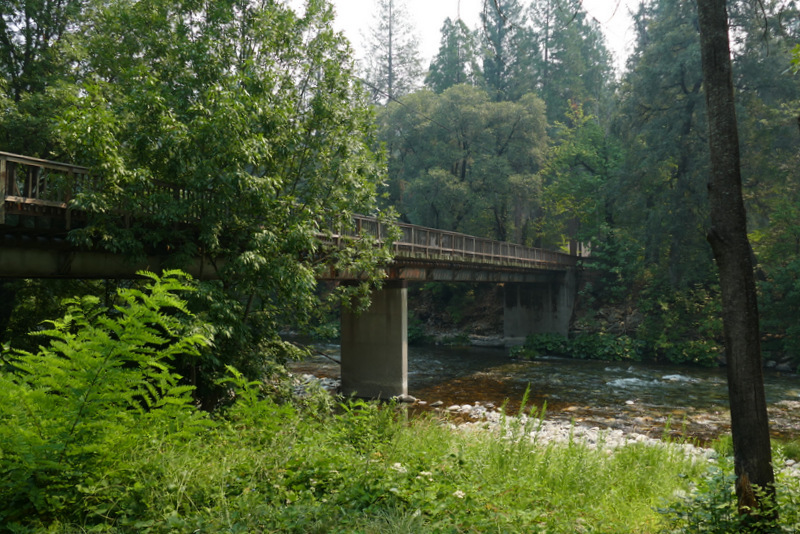 I’m missing that 1st Street Bridge in Dunsmuir and most of the railroad bridges, but i have everything else, and when i get around to it i’ll pull together a photo essay of The Bridges of the Sacramento from the various blog posts i made while gathering the photos over the last year. I spent the night in Dunsmuir and had dinner at Cafe Maddalena, which i recommend because their grilled octopus appetizer was one of the very best octopus dishes i ever ate. 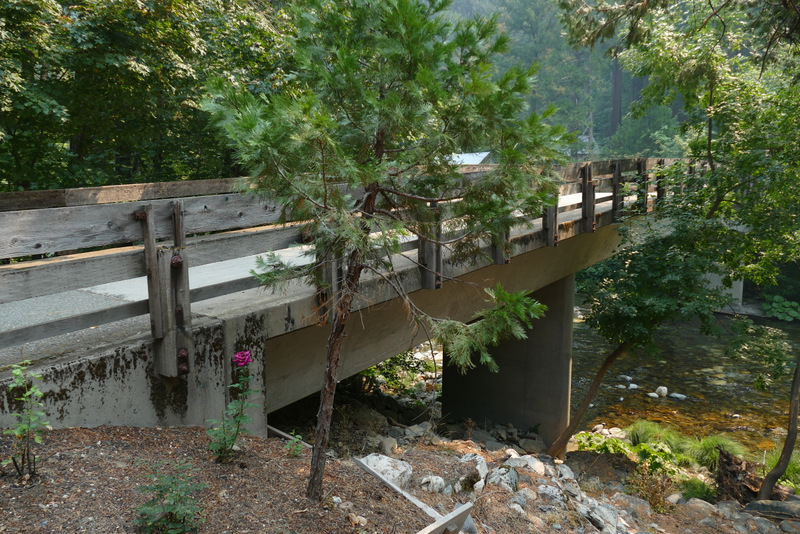 Not that it’s worth driving to Dunsmuir for, but if you happen to be there at dinnertime on a Thursday – Sunday….. Tomorrow i drive up to Springfield, OR, but that’s another story. Stay tuned.